I’ve dabbled with weight training for a number of years but I’ll be honest if I had a choice between a weight-training session or yoga, yoga would win every time. That said, I do think strength training is a key part of maintaining a healthy, happily functioning body and whether I’m working with private clients or teaching group classes, strength and conditioning work is a major theme in my teaching. One of the things I see as a yoga teacher are the consequences of weakness in the body which can lead to musculo-skeletal imbalances, chronic tension and pain. We are so sedentary these days that the major muscles of the spine, hips and abdominals tend to weaken and atrophy leading to lower back problems, neck and shoulder tension and gait issues. It’s at this point that we might be tempted to practice yoga, but if we’re not bringing strength and conditioning work into our practice we might very well end up exacerbating or at best ignoring the very weaknesses that we bring to the mat. Combine this with our current obsession with images of extreme flexibility and range of movement, and we run the risk of doing ourselves more harm than good. Make no mistake, big ranges of motion require a corresponding level of strength in order to keep your joints healthy and to avoid injury. I’d like to share with you a simple yoga sequence for building more upper body strength, particularly in the shoulders, upper back, lower back and abdominals. I’ll be teaching many of these poses in my upcoming September 6-week Yoga for Strength & Conditioning Course. 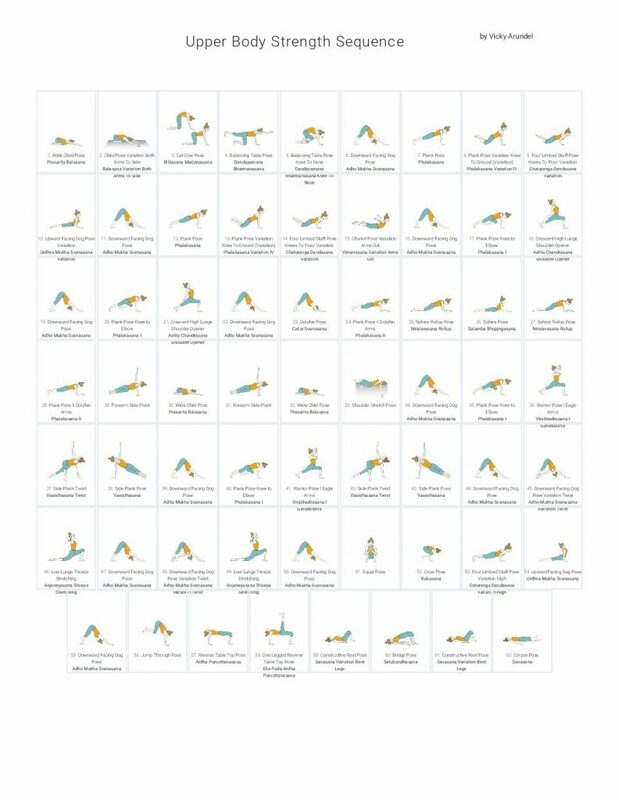 Thanks to Tummee for the amazing yoga sequence builder!